Echoing the position of LANDMARK WEST! 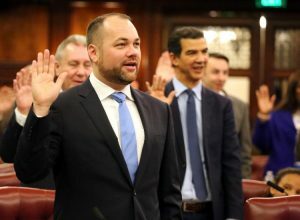 and several colleague organizations, City Council Speaker Corey Johnson announced his opposition to the proposed LPC Rules changes that LANDMARK WEST! informed you about. In his letter to Chair Srinivasan, (Full text linked) co-signed by Rafael Salamanaca, Jr., Chair of Land Use Committee and Adrienne E. Adams, Chair of Landmarks, Public Siting & Maritime Uses Subcommittee, Speaker Johnson acknowledges several areas of the rules that LANDMARK WEST! is also in agreement on, like making it easier for landmark buildings to accommodate barrier free access, and addressing flood and storm resiliency mandates. He continues, however to emphasize the importance of public participation, how it “adds value to our civic processes and, in the case of the LPC, ensures that the Commission’s determinations are based upon the best possible information”. He rightly calls out that “under the Proposed Rules, there is no provision for any kind of public review of these delegated determinations”. Please add your voice! The LPC is accepting written comments until March 27th. The schedule for the hearing will be posted later today at the LPC’s Homepage. Feel free to call us with any questions! (212) 496-8110. ADDENDUM: Read Manhattan Borough President Gale Brewer’s letter to LPC Chair Meenakshi Srinivasan. Read more on this topic in PATCH. Read more about the Rules coverage on CURBED.